Hazel Grace Lancaster: I believe we have a choice in this world about how to tell sad stories. On the one hand, you can sugarcoat it the way they do in movies and romance novels, where beautiful people learn beautiful lessons, where nothing is too messed up that can't be fixed with an apology and a Peter Gabriel song. I like that version as much as the next girl, believe me. It's just not the truth. This is the truth. Sorry. When Hazel tells her mother that she is going to Amsterdam, Frannie consents but wants her to see the doctor. Hazel evades the question of whether she's in relationship with Gus. The next morning, both mother and daughter visit Dr. Maria who has reservations about her health and says that she would approve if someone who is familiar with her condition accompanies Hazel for the trip - Hazel suggests her mother for that. When Gus messages her, Hazel simply switches off the phone. The "grenade talk" between Gus and Hazel is not as serious in tone than in the theatrical version. Following the "grenade talk", Gus and Hazel talk about finding the most creative title for their classified ad for the swing. Gus admits of liking her but they just shake hands. John Green's cameo is longer here. The little girl that Hazel meets in the airport asks her about the tubes on her nose. The man (Green) wants to apologize, but Hazel explains the whole thing and even allows her to try it. She thanks Hazel and then leaves with him. Gus' hands are wet so he wipes it with her jacket. 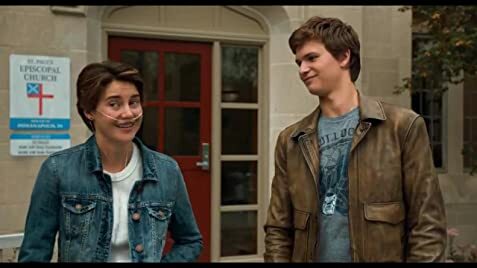 When Gus is driven to the hospital in an ambulance with Hazel accompanying her, he asks her to either tell a story or a poem. She recites poem 'The Red Wheelbarrow'. Q: What is background music and composer being played in pre-funeral scene? Q: Is 'An Imperial Affliction' a real book? Q: What is the name of the classical music being played by the Amsterdam street orchestra? Bring Kleenex. Lots of Kleenex. Wow. 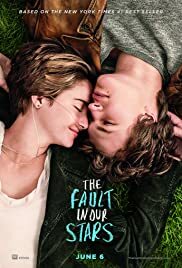 Being an avid book reader, I'm always skeptical about watching the words of my favorite books transformed and materialized on the big screen... but TFIOS stayed true to the book. The movie was absolutely lovely from beginning to end. The young actors were great. The comedy hit on all the right notes, the romance made your heart smile and the tragedy pulled at your heart strings. It really was a wonderful adaptation, and I believe it stayed as true to the book as possible without many changes where there were any. The minute it was over, I wanted to watch it again. Upon leaving the theater, I looked around and there was not one dry eye. Not even the men. If you are a big fan of the book, like myself... and are skeptical about whether this stays true. Don't be. Kudos the John Green on his first film adaptation. It was an absolute success. I'd give it a 10 out of 10 if I could... but I don't believe in "perfect." 195 of 283 people found this review helpful. Was this review helpful to you?